Here at Delicious Reads, we believe there is a healthy relationship between books and food. Palatable pages and delectable foods, one cannot exist without the other. Or can they? Who doesn't like a salad that has a burst of flavor and color? 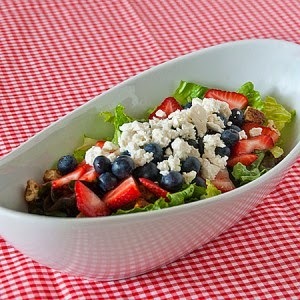 This Red, White, and Blue Summer Salad is a crowd favorite and light on the calories. 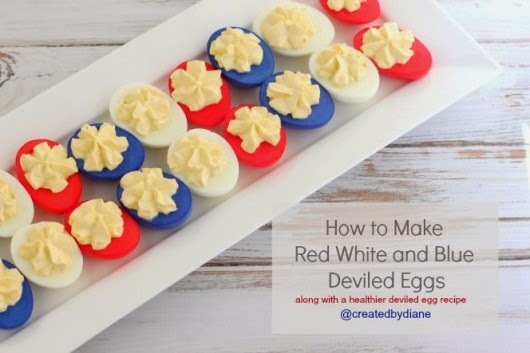 Aren't these Red, White, and Blue Deviled Eggs fabulous looking? Everyone loves a classic deviled egg--adding some food coloring to make these into a bright holiday food will delight your guests and your mouth. You can't have a 4th of July meal without the "rockets red glare." 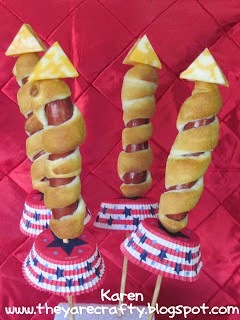 Not only are these Rocket Dogs tasty, but you can use turkey hot dogs (I love the Sara Lee brand!) and low fat Pillsbury dough to make these on the healthy side. 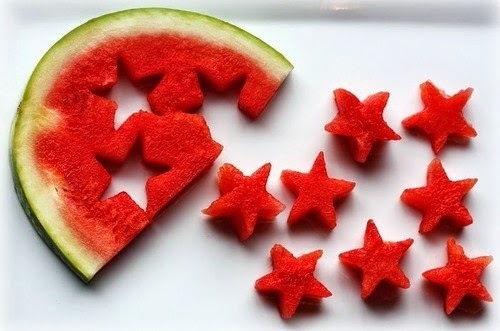 Use your cookies cutters and turn your watermelon into stars for a Patriotic Fruit Salad. 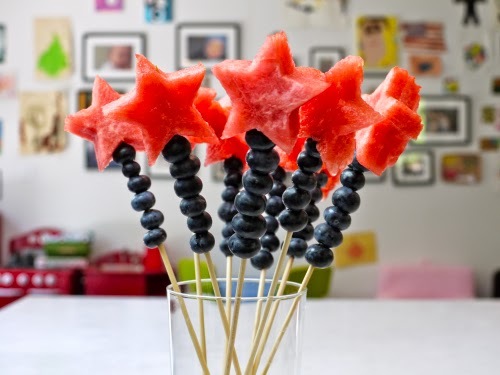 Or make them into 4th of July Wands. I know my daughter would love to wave these around before eating them up! Why not make your vegetable tray fit the holiday as well? 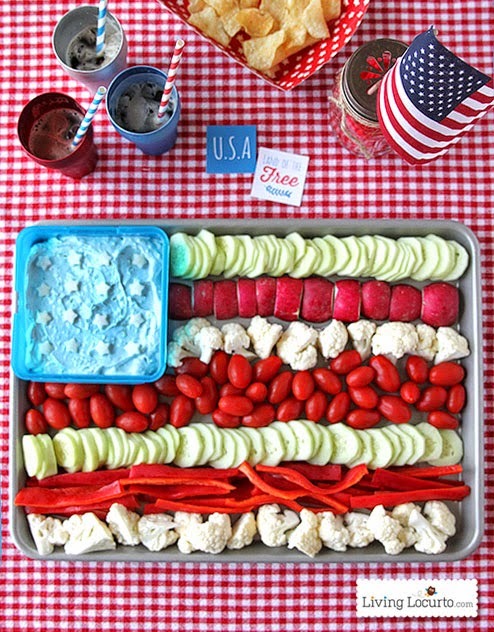 There are plenty of red and white vegetables that would make this American Flag Vegetable Tray perfect for your table. Make your own dill dip with fat free sour cream, light mayonnaise, and fat free cream cheese to keep the calorie count down. Or just buy a premade dip to make this fast and easy. 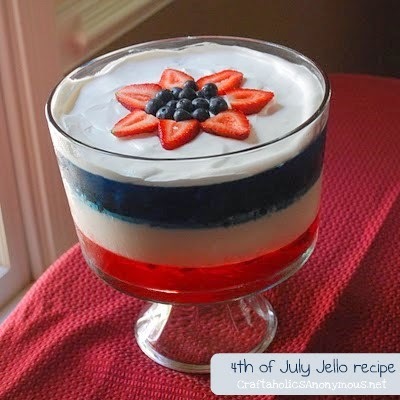 No one can resist this Festive Fourth of July Trifle from Craftaholics Anonymous. To make it even healthier, use fat-free sour cream and sugar-free jello. There are so many healthy salsas out there. Why not make it red, white, and blue too? 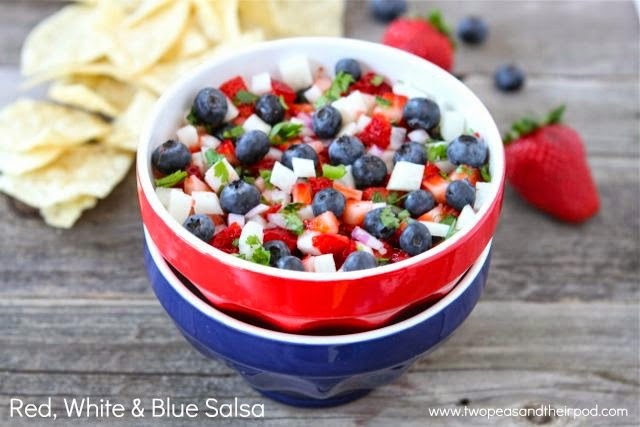 This Blueberry, Strawberry, and Jicama Salsa will add a little spice to your party. Buy some blue corn chips or multigrain baked chips from Costco. You can also make your own healthy chips by cutting corn tortillas with a pizza cutter, spray lightly with cooking spray, sprinkle with salt, and place them in a 400 degree oven for 8-12 minutes. 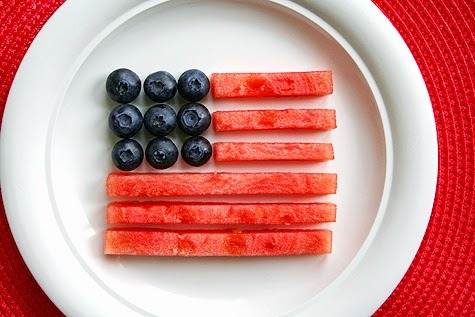 I hope you enjoy your Independence Day this Friday and if you do have time, check out some of our Summer Reads to make your day perfectly delicious. These are fun and delicious ideas! I love summertime food and getting together with family. Thanks for the great post. 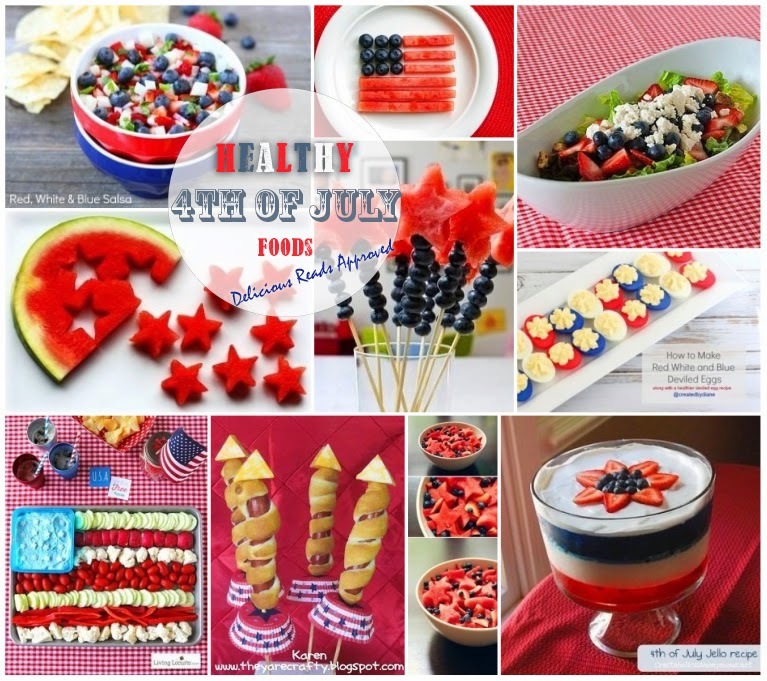 4th of July inspired party is way too cute to see. All the party food is also fantastic. 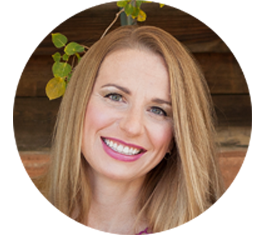 I would love to use these ideas for my son’s 4th birthday bash but at this moment I have been trying to find the best San Francisco venues within our budget. Could you help regarding that? Natural foods are good for our health and can easily aid us in losing weight and staying healthy. It is full of vitamins, minerals and fiber and contains cancer fighting antioxidants that are contained in natural unprocessed foods. Works Cited - Paul, Steve. “FDA Approved Testosterone Boosters List Revealed!” Testosteroneofficial.Com Ie. Testosterone Official, https://testosteroneofficial.com/. Accessed 3 Dec. 2018.